When it comes to cherishing a soothing summer evening, enjoying the fresh fall, or simply cozying up amidst the chilly winter winds, nothing works better than a comfortable outdoor living area. Here are 20 glorious outdoor living spaces that will combine comfort with true prettiness. While everything else, including the rustic wooden sofa, the neutral color theme for the pillows and mattress, and the light grey square-shaped center table sport a subtle farmhouse appeal to it – a little glow brought by a whole spectrum of lights can make everything go for plain to absolutely extraordinary. Install different kind of lanterns, and candles on the table, hanging ball-shaped string lights on the top to get the magic going. If nothing delights you more than the idea of minimalism, this outdoor living space is perhaps, the most wonderful option for you out there. The table in the center seems to embrace its unfinished, unstained look with pride, and the white vase with same-colored flowers installed within complete its look. Neutrals are celebrated with cozy seating and the cushions. What truly encourages lounging on this out-of-the-box outdoor living space is loads and loads of cushions that ditch patterns and prints, instead keeping things stuck to a whole bundle of greys and black. The coordinating seating, the pallet floor, that cute little stool with its intended imperfections, and that wooden coffee table are complete breath-takers. Whether its rectangular flower boxes, winsome hanging plant baskets, pretty terra cotta plants, or simply glorious vases – this creative one of outdoor living spaces has got it all, explaining how fresh greens are true wonders. Amidst so much greenery lie comfortable seating benches in a combination of black and white, letting candles go for the lovely accents. Serenity comes to life with a patio pond and fountain taking this outdoor living area to new heights of awesomeness with its beauty as well as the peaceful sound of moving water. Install as many planters in different designs as you like, throwing in a mix of pillows and outdoor cushions on the sectional sitting arrangement. The rug marks the sitting with great ease. Curtains can work wonders to define a separate outdoor sitting area, establishing the sense of a comfortable room. Putting the sofa together becomes a child’s play when you go for synthetic fills and outdoor fabrics in dark colors with a few light-colored touches, including the accent cushions and pillows. That beer bottle chandelier here is a ‘Best out of Waste’ innovation! No matter how much times seem to have changed, bringing in so many different interior styles, themes and decorations, retro somehow remains evergreen. And that’s exactly what this 70s style outdoor space shows. A simple furniture is painted and upholstered to get the desired look, adding a shelved coffee table right in the middle. We bet one wouldn’t just want to leave this luxuriously decorated outdoor living space marked with natural decor elements and a clever use of beautiful wooden textures for the furniture. The table with its intended imperfections works as the focal point for this personal oasis and gets its finishing touches with candles and tiny pots installed on top. Plant lots of trees on the sides, coupling them up with large round pots loaded with white or cream-hued flowers. The gorgeous pergola here has been built right from the very scratch, further brightening up the deck with a Hampton Bay Raynham 4-Piece Patio Seating Set that includes 2 chairs, a love seat, a coffee table, and 4 throw pillows. The matching ottomans are sheer cuteness, but the pop of color brought by the greenery is simply unearthly. 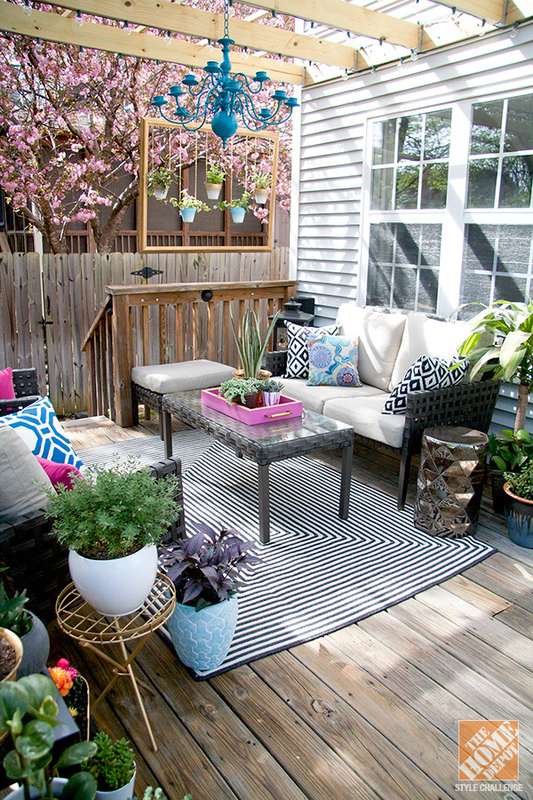 If you are looking out to integrate some color into a neutral-themed patio decoration, the key is to throw loads of colorful cushions and pillows coming with bright patterns or prints. Keeping the weather in mind, you can go for key lime greens and yellows for the summers, while letting oranges and reds beautify the autumn season. A gorgeous outdoor living room or a beautifully decorated patio is as essential a part of your home as the rightly done interiors. And the above ideas for great outdoor living spaces make sure your home lives up to the statement at its best.